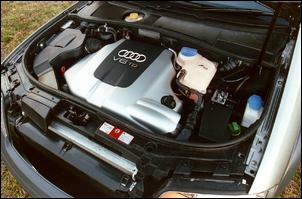 The Audi Allroad TDi is the niche vehicle within the niche. Despite crossover four-wheel drives booming in popularity, diesel-powered ones are a rarity in Australia - and $88,000 diesel crossover wagons unknown. 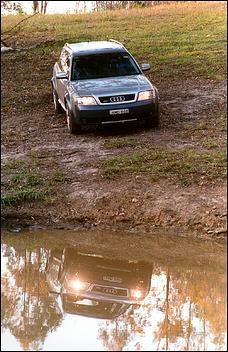 Until the Audi. So does that make it an unviable curiosity, a vehicle that will attract a very limited range of buyers - and may well suffer the resale consequences a few years down the track? Possibly - but we can say one thing with certainty. 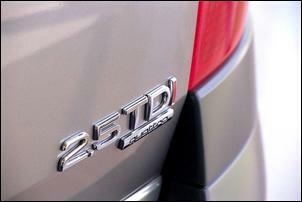 Those people pedalling the TDi Allroad will be very happy. The Allroad is based on the A6 wagon platform in the same way as Subaru's Outback is a Liberty wagon that got dirt under its fingernails. It's available in three forms - a twin turbo 2.7-litre V6 developing a hefty 184kW and 350Nm and which can be bought as a manual or auto, and the auto-only 2.5-litre V6 diesel turbo with 132kW at 4000 rpm and massive 370Nm from 1500-2500 rpm. If this isn't the best turbo diesel engine in the country, then we don't know what is. Using direct injection, a variable geometry single turbo, double overhead cams per bank and a massive front-mount intercooler, off idle the engine simply pumps out power. Despite weighing 1825kg, with that wall of torque to kick it along the Allroad never feels like a slug - in fact the response is more than likely to put a smile on your face. Off the line there's a noticeable hesitation as the turbo builds boost, then - whoooosh - the torque arrives and the engine rockets around to the 4500 rpm redline, unusually for a diesel, pulling hard all the way. The auto slides to the next ratio - which puts engine revs slap-bang in the middle of that torque plateau - and she's off again. Audi claim 0-100 in 10.2 seconds, but the rolling times are far faster than this standing start time would suggest. On the road it feels an easy mid-8 nought to one hundred car, and you really only notice the absence of brutal top-end power when climbing long hills at high speed. And talking of those, Audi claim 205 km/h as the top end....at 140-150 the car felt like it was loafing along. However, use all of that bottom-end grunt and you can pay a surprisingly high penalty at the fuel pump - the Allroad's government test City cycle figure is 13.4 litres/100km, although the Highway figure is much better at 7.5. In a wide mix of driving biased more towards freeway than climbing mountains, we averaged 10.1 litres/100. And what about that horrible diesel rattle? There's no getting away from it - the TDi Allroad is noisier than the equivalent petrol engine version. Despite extensive soundproofing - including a rubber bonnet seal right around the engine bay - a distinctly different engine note can be heard inside the cabin. It's more of a whine that a rattle - though passers-by hear a normal diesel. But at cruise the car is commendably quiet - the unusual engine note can really only be heard when accelerating. Backing the north-south engine is a 5-speed Tiptronic stye auto. Programmed to change with alacrity, it works well at keeping the diesel on the boil, although some people may be a bit disconcerted by just how many gear changes it makes. Across in manual mode it continues to perform - even in difficult road conditions, where selecting first gear gives excellent engine braking. About the only black marks on the driveline scoreboard are that reluctance to leap quickly away from a standing start - and an occasional harsh transmission change, especially with a throttle lift. The suspension is as sophisticated as you'd expect with such a premium base car. Nope, make that even more sophisticated. At the front a four link design is used with a tubular anti-roll bar, air spring/damper and twin-tube gas dampers. At the rear you'll find double wishbones, another anti-roll bar and a combined air spring/damper. The reason for the 'air' bits is that the Allroad boasts in-cabin height-adjustable suspension. Push a button on the dash and the Allroad will slowly crank itself up by as much as 66mm - the system allows the selection of four discrete ride heights. The lowest ride height gives a ground clearance of 142mm, and is designed for use at high speeds, where it's suggested that a lower drag coefficient results. 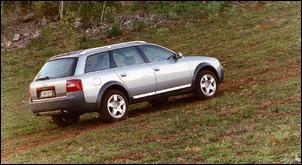 (However, the Allroad's 0.36 Cd is one of the worse that we can think of for any current car.) The highest setting results in a ground clearance of 208mm, with this able to be obtained only when the vehicle is travelling below 35 km/h. In fact, the system can be configured to raise or lower the body automatically, depending on speed. 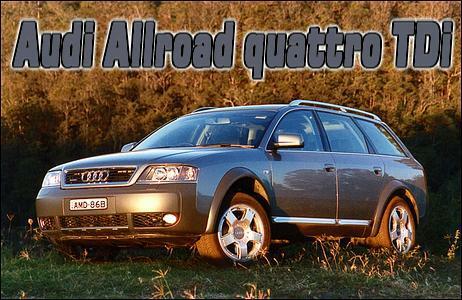 And so how does the Allroad handle? With the suspension set to either its very low or standard ride heights, on the bitumen we were initially quite disappointed. Despite using Torsen centre diff constant four wheel drive, and boasting stability control, traction control and an electronic diff lock (is there any car sold anywhere with more traction control aids? 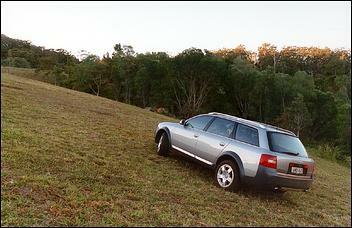 ), in tight corners the Allroad can easily become a plough understeerer. The stability control feels programmed to allow this to occur - a disappointing trait. On more flowing roads the Allroad does well, although throw in some bumps or undulations and the suspension damping feels rather too soft. 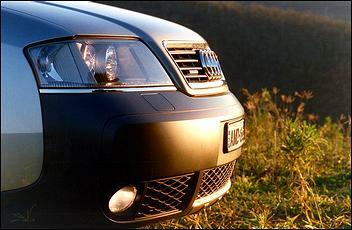 In fact, while the Allroad can be hustled along quite quickly on its 225/55 Goodyear Wranger Allroads(! ), it never feels quite as composed as it should - and is literally kilometres behind its sporting brother, the S6. But all is forgiven when the roads turn really nasty. We took the Allroad along the worse tracks we could find, suspension set at max height and the diesel idling along in a Tiptronic first gear. And in these conditions - for a crossover car-based four-wheel drive - the Allroad was exceptional. Craters 30cm deep in the road surface were nonchalantly walked through with no bottoming-out, and on steep loose surface tracks, the traction was phenomenal. One huge advantage of the Audi's four wheel drive system is that the driver doesn't have to do a thing - the electronics and mechanicals work seamlessly to get every Newton-metre down to the surface. Inside, the Allroad is lavishly - and practically - equipped. The seats are comfortable and supportive, with plenty of room in all directions front and back. The doors are all equipped with pop-out storage compartments, and there's a tall (albeit shallow) glove compartment. Six airbags - including head airbag curtains - are fitted as standard, and you'll also find an in-dash 6-CD stacker and rear subwoofer (system treble is a bit flat), zone adjustable climate control which includes an auto recirc button, trip computer, and centre fold-down armrests front and back. The instrumentation is clear - although with Audi's horrible 70-80-100-120 large number increment change on the speedo - and includes an engine oil temperature readout and voltmeter. The car looks and feels beautifully built - the doors shut well and all controls work with Gemanic precision. Lift the large tailgate and you'll find not huge space, but an area that is very useable. Both a roller blind and a cargo net are provided, and the rear seat - which folds down on a 60/40 split - incorporates a ski-port. The cargo area incorporates four metal tie-down hooks, and a 12-volt power outlet is also provided. A warning triangle in stored in the rear door, but lift the floor and you're in for a bit of a shock - a spacesaver spare wheel on a car that's much more likely than a normal vehicle to experience flat tyres? 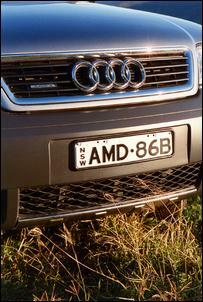 The Audi Allroad TDi was supplied for this test by Audi Australia.